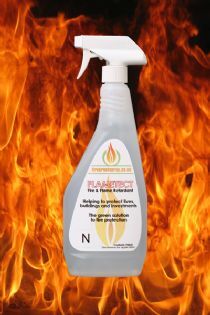 Spray on your materials and they become fireproofed, it's that easy. The product is skin friendly for use on all natural & most synthetic materials including lampshades, clothing & furnishings. Works by disrupting the burning process & quickly converting natural & synthetic materials to carbon creating a flame retardant carbon barrier. The product is a water-based fireproofing spray. Non-toxic, non-hazardous formulation that is easy to apply. It's Non Hygroscopic and Non-Corrosive to metals. Unlike other competitors products, will not corrode metals which is especially important for metal lampshade frames. Treats Cotton, Silk, Board, Linen, Polyester, Wool, Cardboard, Untreated Wood, Polystyrene, Lycra, Hessian, Foam Rubber and most other materials that can absorb.